Mosi-oa-Tunya: the smoke which thunders. Otherwise known as Victoria Falls, one of the world's greatest forces of nature. Nothing can prepare you for the sheer enormity that is Victoria Falls. From Livingstone, the white haze in the distance; not quite cloud, not quite fog, is a constant reminder of the Unesco World Heritage Site close by. But Victoria Falls is much more than a ridiculously large waterfall (the world's largest, in fact). It's also a thrillseekers paradise. 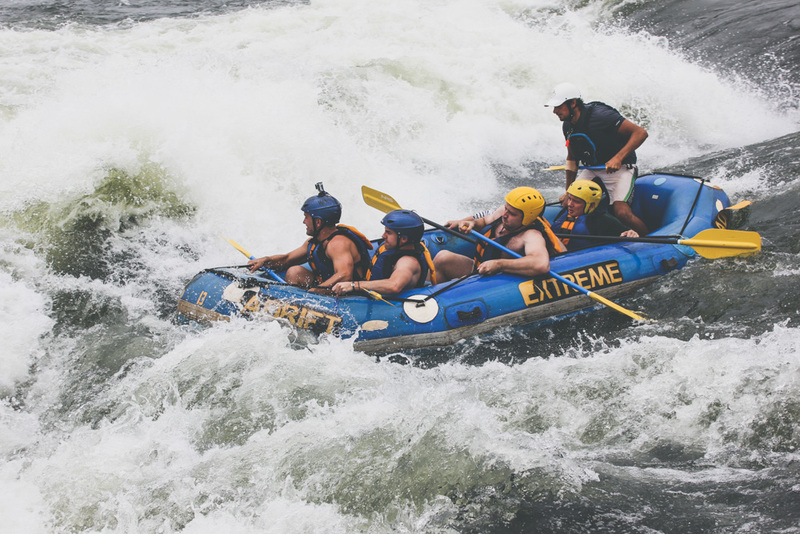 If you're an adventure-seeker craving a new burst of adrenalin, (or you're just looking for something different to do on your travels), we’ve put together our Victoria Falls guide for you; the top activities that will be sure to get the heart racing! Obviously! While this might not immediately seem like a huge thrill seeking activity, the rush of exhilaration you experience when you see Victoria Falls for the first time is matched only by the rush of water that showers over you. 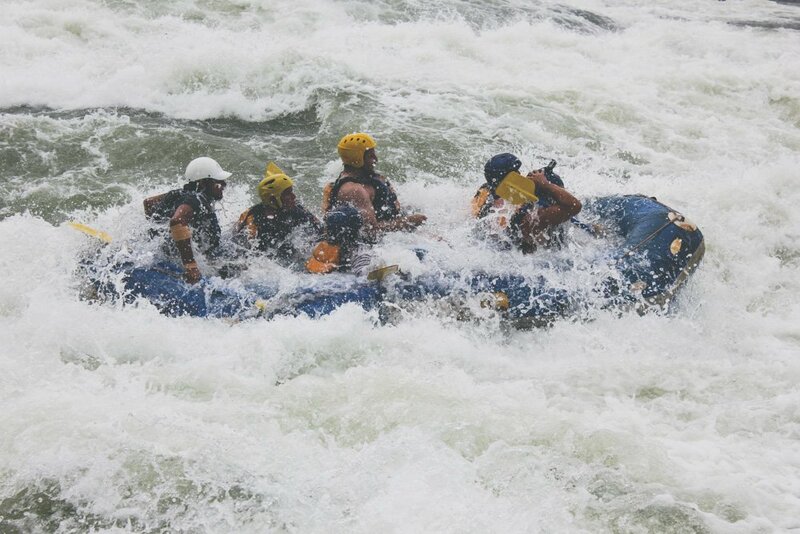 The best time to visit is July when the waters of the Zambezi are flowing heaviest. This is the definition of insanity and we love it. Your guide, with the balance of a trapeze artist, leads you out to Angel’s pool where you literally stand on. the. edge. of Victoria Falls. Here, you can take the most insta-worthy photo of all time and scare the bejesus out of friends and family back home (sorry parents!). Note: If you are doing this as part of the Livingstone Island tour ($95USD with Shearwater Tours), you'll also enjoy a delightful breakfast post swim to calm the body. What better way to see the Falls than to fly over them! Microlight flights allow you to get a bird's eye view of the (roughly) 625 million litres of water flowing over the edge to the base below. An added plus is you won't get wet! A 15-min flight is $170USd - well worth it for a once in a lifetime viewing opportunity. This is pure adrenalin. The jump is a heart-stopping free fall of 111 metres, with the Zambezi river flowing fast below and the epic Victoria Falls as a backdrop. If you want that extra kick (we’re not sure why you would! ), try the bridge swing! The Bungee Jump is $160USD by itself, but from now until the end of 2015 you can tick off the 'Big Air Experience' (Bungee Jump, Bridge Swing & Bridge Slide) for only $210USD. Yikes! Floating down rapids in a flimsy inflatable boat with crocodiles loitering on the shore may sound like hell to some people, BUT we can assure you that it is actually incredibly exciting and will definitely get the adrenalin pumping. If you’re going to raft anywhere, this is the place to do it. A day's rafting will set you back around $150 USD. Been to Victoria Falls yourself? What was the highlight for you? Let us know in the comments below!